Thérèse Lebrun (Personal show 2014). 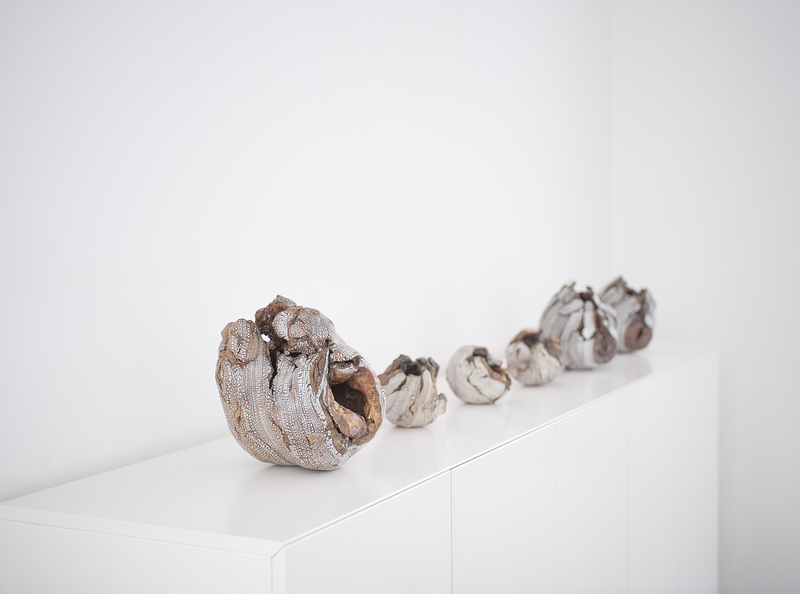 Born in Nagoya in 1957, renowned international ceramic artist Yoshimi Futamura returns to Puls for the third time in the last decade. Except for periods as an artist in residence in her native Japan and in China, she has lived and worked in her studio in Paris since 1986. These rugged stoneware works have an aura of forms that might be found in nature. It is work that both challenges and affirms the very meaning of the term Japanese ceramics. 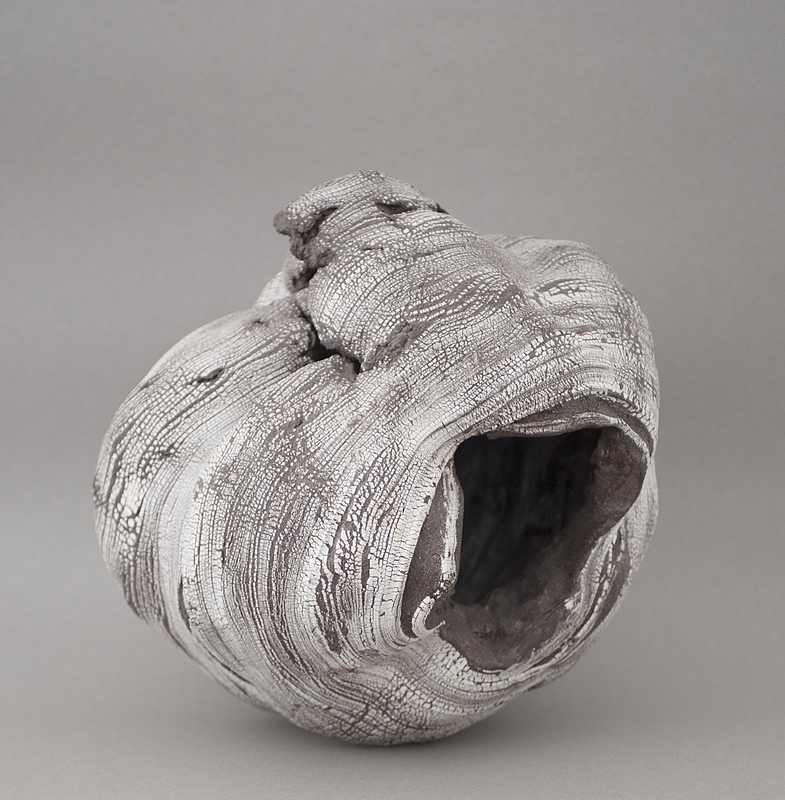 Futamura emphasizes natural kiln effects as a fundamental element in her art. She says of her ceramic sculptures, "I seek to express movement, to express the power that lies within clay." 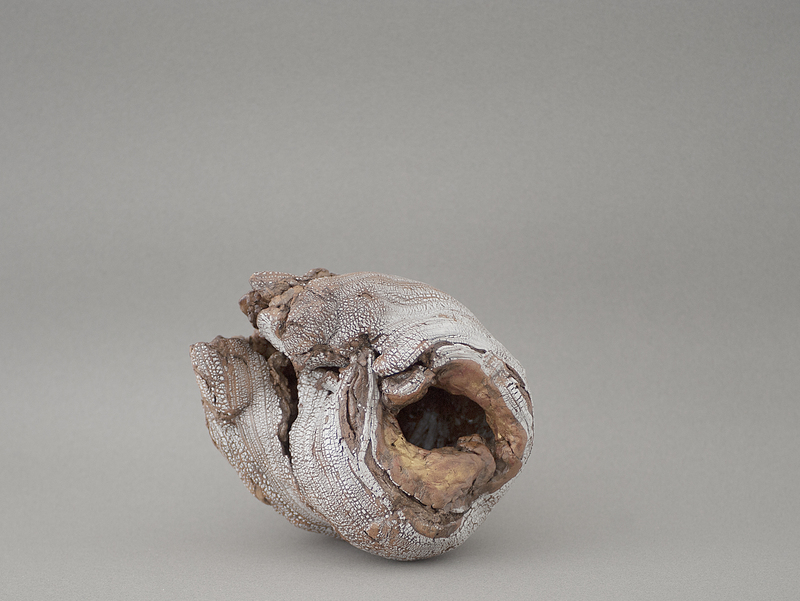 The material itself emphasizes living nature, cracked almost lava-like structures, breathing clay that seems almost alive. Surfaces inlaid with banded granules of pre-fired crushed white porcelain seem reminiscent of some wild snowy landscape. Pieces often have a charred appearance, not unlike burnt firewood. She has captured and frozen a moment in time in every piece. Indeed, each one evokes in its own way the scarring yet naturally beautiful effects of the firing. Compared to many countries, Japan is a ceramist’s paradise, at least in its profound appreciation of this medium. While it prizes ceramic art above all others, it is not without strong societal restrictions on artistic careers for women. Given the formality within the Japanese ceramic tradition, the relative openness pervasive in the European art world and its lack of gender bias held the allure of freedom for Futamura. In breaking away from the sometimes subtle but seemingly inevitable national limitations, Futamura has become a celebrated artist around the world. She is a compelling example of the changes occurring in Japanese art and society over the past three generations. It has been said of her work, “She is not an artist simply because she sculpts objects or makes pots that have no practical use. She is an artist of the very first rank because she is a poet in her own medium. Her work shows total mastery of her materials; it has mystery, an unsaid quality. It is alive." Taught by recognized masters in her native Japan at the School of Ceramic Art in Seto from 1979-81, she is also a graduate of the Centre Artisanal de Ceramic de L’Ecole Duperré in Paris. She creates ceramics in the tradition of Japan’s great masters yet embraces the infinite possibilities inherent in clay. However, in spite of diverse international influences over the years, in many respects the work remains deeply Japanese. Her materials evolve into random but solid forms in her hands. Their very nature is rich in mineral and rough material; nature and cultures have kept a close relationship with her. “The earth is the raw material of my work. I strive to express its energy and natural strength. Earth plus Water plus Fire. It is thanks to these three elements that I can give birth to a new life." Now an acknowledged master of her medium, she has confronted tradition while exploiting the flexibility and suppleness of clay in arresting ways. Futamura’s works are in major museum collections across the globe. Honored as a prizewinner in competition around the world, her work holds pride of place in collections ranging from the AIC Ariana Museum in Geneva to the Yale University Art Gallery in the USA and in major private collections from Japan, China and Korea as well as Europe and North America. Yoshimi Futamura (Personal show 2010), Yoshimi Futamura (Personal show 2006), Happy Christmas Stocking 2010.